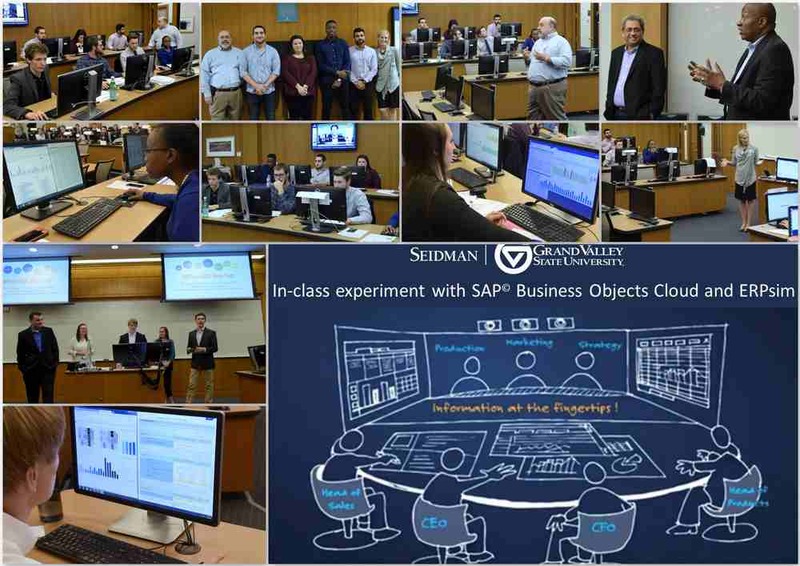 This week SAP and Grand Valley State University (GVSU) hosted one of the first In-class experiment with SAP Business Objects Cloud and ERPsim – an experiment that combined best practices from Design Thinking, BOC and the Extended Logistics ERPsim game. The goal of the event was to see and demonstrate the capabilities that are available in the Board Room of the Future. San Diego State University students and faculty Nancy J. Jones will also be experimenting with the technology. Many at GVSU came together to provide an amazing experience. Dr. Simha Magal – Professor of Management, orchestrated the entire event. Meagan Knoll – Affiliate Faculty, provided the instruction to students and did an amazing job helping the students understand design thinking and the ERPsim game. Dr. Thomas McGinnis – Assistant Professor of Management, prepared the dashboard designers with the use of Business Object Cloud. Chris Gillespie– SAP systems administrator, made sure all systems were ready to go. Diana Lawson – Dean, was incredibly supportive as well! SAP Former Member, Senior Vice President | Head of Diversity & Inclusion SAP Office of the CEO, was instrumental in assisting the GVSU team to prepare and was a huge inspiration to the students when he attended the event.